A simple and delicious Pulao with King Prawns. Ideal for a weekend lunch or dinner. 2. Saute the onions for two minutes. 3. Add the ginger garlic paste, cinnamon and stir well. 4. Stir-fry for two to three minutes. 5. Add the tomatoes and stir again. 6. After 2 minutes, add red chilli powder and mix well. 7. Mix the saffron strands with the milk and stir well. 8. Add the rice to the pan and cook for 3 to 5 minutes. 9. Pour 1.25 litres of warm (or hot) water and reduce flame. 10. Cover the pan with a lid and cook for 10 minutes or until the rice is half-cooked. 11. Add the prawns, green chillies and garam masala powder. 12. Sprinkle a bit of salt and stir well. 13. Cover and cook for 5 to 8 minutes or until the prawns turn pink and rice is cooked. 14. Add the saffron milk and gently mix. 15. Remove from flame and garnish with coriander leaves. 16. Serve with raita of choice. 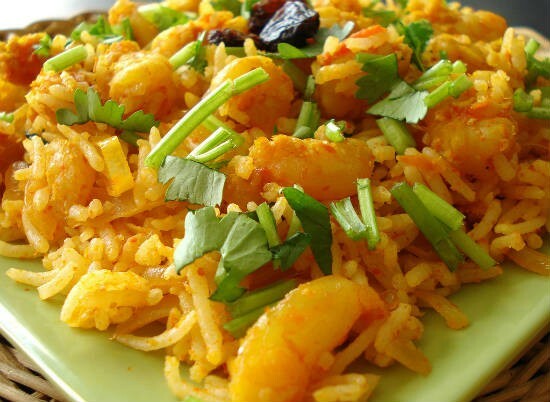 Feel free to comment or share your thoughts on this King Prawn Pulao Recipe from Awesome Cuisine.